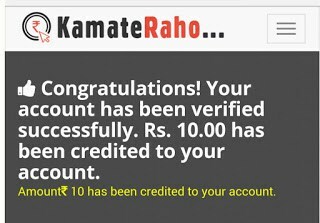 Hello Dealsnloot readers,Now Get Rs.10 For Signup From KamateRaho. You can also Refer Your Friends to earn Money. You can Transfer Your all Earning to your bank account. KamateRaho is a website like other free recharge apps.The only difference is you don’t need to download any app.You just have to register on the website to get the credits.It’s a Good trick to Earn Unlimited Bank account from this website.We have looted from online Refers, But today again we presenting a trick to Loot again and Earn Free Bank cash from Referring to friends or family.You can also withdraw earning with Bank account or Direct Mobile Recharge from this website, So Its a Big loot. Update :- Every time Try To Redeem Recharge Because The Bank Transfer System Is No. Working.I Am Request For Bank Transfer In January 2016 But Not Received Any thing Only Show Pending .Minimum Redeem For Recharge Is Rs. 10. Sign Up and Enter Your Details & click on Register. Go to Entered email Address and verify also it now via clicking on Verification email. Voila !! You will Get Rs 10 in Your wallet on the Successful Registration process. To Redeem Your earning Rs 10 Free recharge, You need to complete 1 offer. Guys Don’t Worry, Its So Simple as Sounds. Go To Kamateraho Offer Page And Complete Any 4 Offer And Get More Rs. 10 Credit As A Bonus In Your Account.And Redeem To Recharge. Go to Invite Friends option. Share Your Referral link with friends to earn more. You will Get Rs 5 per Refer. You can Redeem you’re earning with Bank account also. 1.Open The Website and copy Your referral link. 2.Now change Your IP address as the website Saves the Ip from which the account is registered. 3.You can use any Vpn app or hidemyip for changing your ip address. 4.Now Open kamateraho website using your referral link. 5.Signup using a different email address and verify it to Get Rs 5 in your main account + Rs 10 in new account. Repeat the process above to earn unlimited. you will get instant 10Rs in this account and 5Rs in main account. repeat above steps to get unlimited recharge. repeat above steps and get unlimited recharge. whats the unlimited trick in this we have to verify the gmail id...!!! it shows vpn found.... what to do?